HELP US CURE EATING DISORDERS! 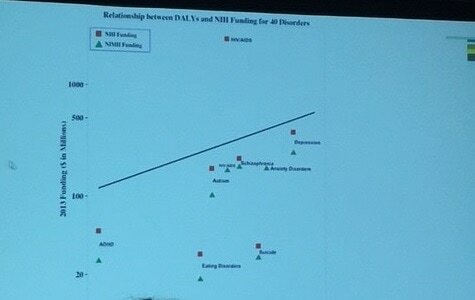 In the current political and social environment funding is limited for research to promote better mental health, specifically for eating disorders. 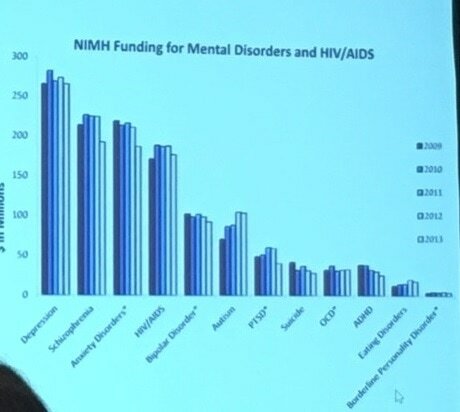 Here is a picture of the current funding for eating disorders from the National Institute of Health. What it shows is that despite the high cost to society (not even considering the impairment and suffering) eating disorder funding is at an all time low. $20 provides participants with our workbook on imaginal exposure therapy. $80 funds a participant in our mobile app study leading to personalized eating disorder treatments. $100 funds a participant with an eating disorder to receive 10 sessions of free therapy in our imaginal exposure study. $200 funds a graduate student to travel to a conference for eating disorder training. $300 buys a tablet for participants to use during the research study. $500 funds 10 graduate students training in empirically-based prevention programs. Please make sure and specify the EAT lab in the 'other box' if you want your donation to go directly to our lab. Any questions or comments, please email Dr. Levinson (cheri.levinson@louisville.edu) or fill out the contact form below.